Many Pool Companies may recommend draining your pool and acid washing the plaster to take your pool from Green to Clean. At JB Grande, we see that only as a last resort. Our green to clean process doesn't require draining your pool. Our certified pool operator will professionally test your water, optimize the chemical balance of the water for killing algae and then utilize the most effective form of Chlorine to kill the algae once and for all. Most times, we can take your pool from green to clean in 48-72 hours. The time needed to take your pool from green to clean will vary depending on the type and condition of your pool filtration system. 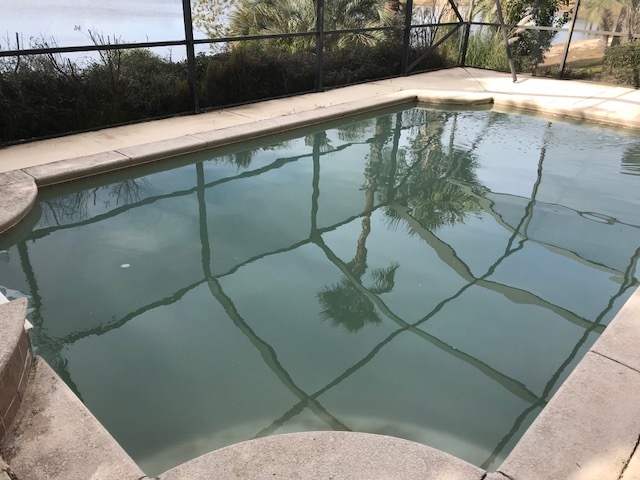 When you need a clean pool quickly, call JB Grande for the best pool cleaning in Destin, Miramar Beach and all along 30A. For the best pool cleaning in Destin, Miramar Beach and Santa Rosa Beach hire JB GRANDE. We just took over this 40,000 gallon salt water pool overlooking a lake. 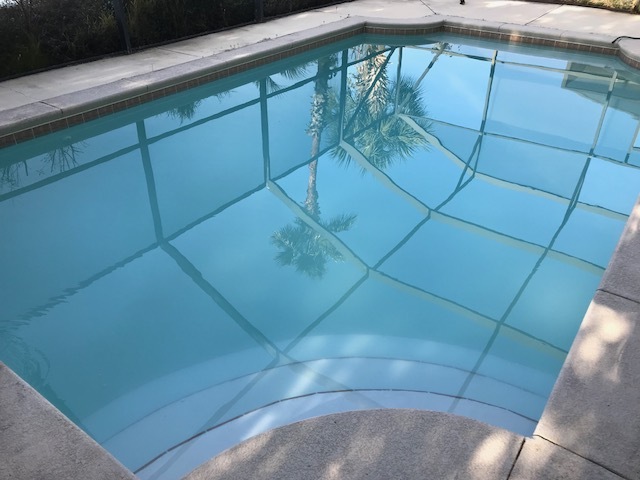 After a thorough cleaning of the glass pool tile and replacement of the salt cell, this pool is ready for the holidays and summers to come. It includes a 4,000 gallon spa, water fountains on the splash pad and a swim up bar. Calcium on pool tile can build quickly when not addressed at first sight. Calcium build up on the pool tile within the pool is usually caused by high calcium levels and poor water balance. However, Calcium on the exterior of a spa wall or water feature wall is generally caused by the heating of the water and the air temperature. When a pool heater is used the outside air temperature is normally much lower than the water temperature, especially in spas. The huge difference in temperature causes the water to be drawn through cracks in the walls. The result is calcium build up. If you are experiencing calcium build up on your pool tile, give us a call or send us an email to schedule a free estimate. For the best pool service in Destin, Miramar Beach or Santa Rosa Beach choose JB Grande. There are so many amazing pools in this area. We couldn't believe our eyes when we arrived at this neglected pool. We knew this would be an awesome transformation from Green to Clean by JB. We spent a whole day cleaning the entire pool, removing the calcium from the pool tile and servicing the equipment. For the best pool service in Destin, call JB Grande. We are excited to add another salt water pool to our pool route on Hwy 30A in Santa Rosa Beach, FL. After a year of pool service on the neighbors pool, this owner decided to change pool companies. We met with the owner and explained our process, services and pricing. The owner stated, "I've been watching your company for a year. I know that you do an excellent job maintaining the pool and have great rapport with the guests that rent the property. I have no worries that you will show up every week and care for my pool when I'm not around. My neighbors highly recommended you and I have seen your results." As you can see, the pool didn't need to be drained, acid washed or pressure washed. The pool water simply needed to be tested, balanced, chlorinated, cleaned and filtered. If you have a green pool. don't drain it, call JB and get a professional opinion from a company that delivers proven results. Never let it go green again by using our weekly pool service. We also offer pressure washing and home maintenance services.